Sarah Nader- snader@shawmedia.com Shawn Casten (left) of Crystal Lake looks on while instructor Steve Thompson (right) teaches his Introduction to Machining and CNC class about surface finish at McHenry County College in Crystal Lake Monday, June 2, 2014. 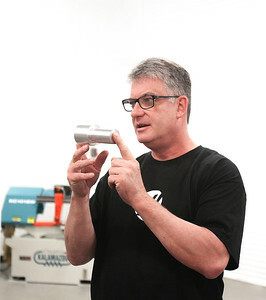 Sarah Nader- snader@shawmedia.com Instructor Steve Thompson teaches his Introduction to Machining and CNC class at McHenry County College in Crystal Lake Monday, June 2, 2014. 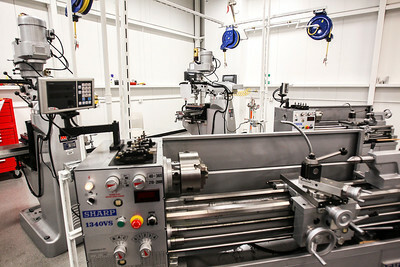 Sarah Nader- snader@shawmedia.com Manual machines, CNC and mill machines are used by students working towards their CNC Machining Certificate at McHenry County College in Crystal Lake. 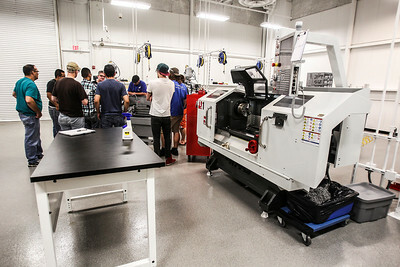 Sarah Nader- snader@shawmedia.com Students surround a manual machine during their Introduction to Machining and CNC class at McHenry County College in Crystal Lake Monday, June 2, 2014. Sarah Nader- snader@shawmedia.com Brock Steffen (center), 19, of Crystal Lake feels a piece of metal while learning about surface finish during his Introduction to Machining and CNC class at McHenry County College in Crystal Lake Monday, June 2, 2014. Sarah Nader- snader@shawmedia.com Instructor Steve Thompson (right) teaches his Introduction to Machining and CNC class about surface finish at McHenry County College in Crystal Lake Monday, June 2, 2014. 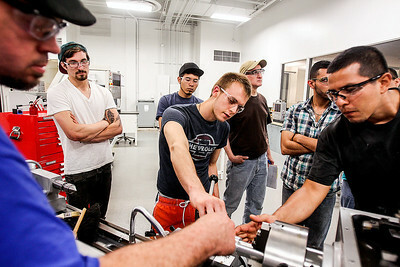 Shawn Casten (left) of Crystal Lake looks on while instructor Steve Thompson (right) teaches his Introduction to Machining and CNC class about surface finish at McHenry County College in Crystal Lake Monday, June 2, 2014.